I'm new to the forum and I'm looking for a replacement for my VFR800. 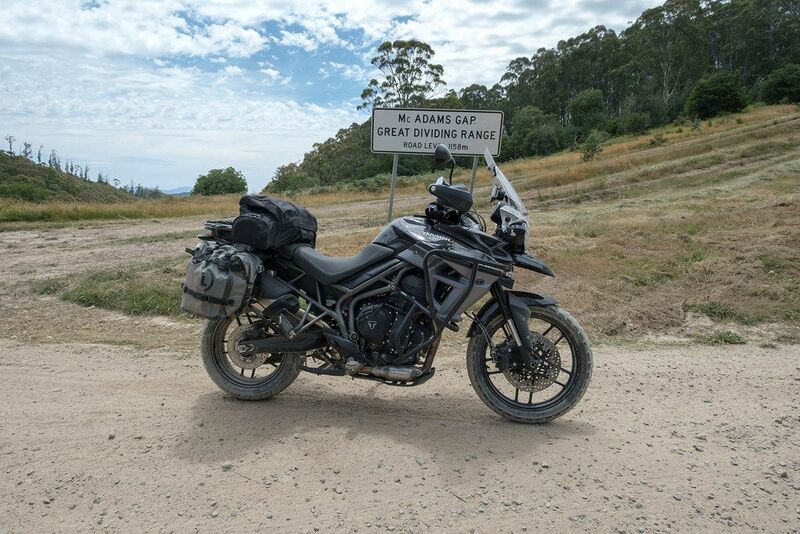 The Tiger 800 is on the short list as the XR series can fit my 30-inch inseam, and it looks to be an all-day tourer. I live in northeast Nebraska where there are lots of unpaved roads, but I'm primarily interested in the pavement. I find it interesting that all my favorite tires on the sport touring side have sizes to fit the Tiger. My most recent adventure was a circle route around Lake Superior that covered 1900 miles. I've had the VFR for 9 years so it's probably time for a new ride. I'm here to learn, so take me to school! Going to be keeping the Viffer? % of time expected on the dirt? Gear carrying load on and off dirt? Hi & have you had a test ride yet? I'm sure you won't be disappointed. Like you, I too suffer from 'duck's disease' (me bums too close to the ground) and on a good day have a 29" inseam. Been a Honda guy most of my life and love the Viffers BIG time. But moved away from Honda as my daily ride about a decade ago. My ride immediately prior to getting my new MY17 XRT in March last year was a Zooki DR650 (great bike for sure, but just not great for me. The 'wooden G-string' seat just killed me and the height too was an issue, even after faffing about endle$$ly with dogbones, seat foam etc.) The one before that was an '07 Wee Strom, owned for about 8 years, and while I really loved it, doing over 40,000 kms, it was also a bit on the high side and heavy also had to faff about with the seat. Did a whole bunch of research and found a) bugger all goes wrong with them with simple servicing, b) VERY few available for sale used and those that are, don't sit around for long and c) this forum is a great resource of VERY knowledgeable, friendly and clever buggers who have helped many come to grips with their Tigers. As said, back in March 18, I test rode a spanking new standard height MY XRT and for me it was simply true love within 30 metres. Things I love include the seat comfort, the seat height really is quite OK and is really quite confidence inspiring (at 810mm on the lowest setting) and seems even more so as I get more miles on it, the ergos are fine for a shorty like me, the engine smoothness and power delivery, along with the gear change is just buttery smooth and a joy to behold and experience, the fully electronic cruise control is a true game changer and you will never EVER want to ride any distance on a bike without one ever again, trust me. Fuel range is fine, well over 350 kms per tank IIRC. To summarise, it has the smoothness, aural sound track and similar amounts of power and type of delivery as my classic '78 Honda CBX six cylinder, combined with the all round 'go anywhere' versatility and practicality of my dearly departed Wee Strom, and yet with the icing on the cake being all the lovely creature comforts available on a high end BMW - but without the 'Break My Wallet' price tag. What's not to love? The more I ride it, the more I love it and I am pretty sure it will see me off this mortal coil. Take your time with the decision, it is a big one to make for sure. For my humble needs, it truly is the perfect motorcycle and I think, after 50 years farting about with compromises, I have actually found my two wheeled Nirvana. But YMMV. @davamb Since I have almost no dirt experience, I'm really uncertain if I'll have much dirt time at all. I ride a minimal amount of gravel roads which are common in the US Plains States, mostly to get to camping areas at rallies and my parking lot at work. My normal tours involve 60 liters in the panniers and a large tank bag. Occasionally, I'll put a tail bag with camping gear in the pillion area. My wife is not a fan of riding, so I'm guessing that I won't have any significant time with a pillion. I've been married for 37 years and don't look for pillions if you know what I mean. I believe I've narrowed it down to an XRX or XRT that has been lightly used, although I would consider an older ABS. I had originally thought I would get a low seat to take me down to 790 mm, but I'm encouraged by the post here of success at 810 mm. I do not want the XRX Low as I think it limits the bike too much. I'll post my questions as they come to me if I can't find answers already in the forums. I've spent a decade in VFRWorld and VFRDiscussion and know how much I hate seeing questions that were answered long ago for which there are no new answers. agree with what HerdyGerdy says, the XR sounds like go for your use. Try the XRx/XRt on low seat position and see what you think. I reckon you'll find it to your liking. Chuck some paniers on or a throwover on the pilion seat and you're off. Great distance muncher and fine on the odd bit of gravel. I believe I've narrowed it down to an XRX or XRT that has been lightly used, although I would consider an older ABS. Having owned a Roadie (800 ABS) and now a XRX go the XRX or XRT. Way better package. The throttle response with the FBW throttle is greatly improved over the earlier cable throttles and there are a host of small but significant improvements including the Comfort Seat - Roadie seat was average at best and shaped a little strange, Cruise Control - one of the best going around once you use it you would not be without it, Better shaped handguards - they direct the air away from you not at you, improved fuel mileage - not a lot but better, better heat control from the engine - the Roadie would cook your knees and legs in warm/hot weather, Main stand standard - 'nuff said, Extra electrical outlet on the side standard, Hazard lights - were not even fitted to the Roadies in this part of the world, Off Road Map - personally don't use it a lot but handy to have to be able to set up to kill the ABS and traction control on dirt roads. Last weekend. 300+ miles - 150 of which were on dirt roads. Great bike for that use. I certainly wouldn't worry about the seat height, I'm 5'5" with a 29" inside leg and I have no need of lowering kits or the XRX Low model.